High-resolution images are great for printing photos from your Samsung Galaxy Note 3. They’re good for photo-editing. They’re not required for images you plan to share with Facebook or send as e-mail attachments. Plus, the higher the resolution, the more storage space the image consumes. You don‘t always need to use the highest resolution. Set the image resolution before you shoot the picture. In the Camera app, touch the Menu button. The Settings window appears. You can also get there by choosing the Settings icon, which is why the Settings icon is the Settings Settings Settings icon. The numbers in the white circles on the menu represent megapixels. The other numbers represent the horizontal-by-vertical image resolution in pixels. The final numbers (in parentheses) are the aspect ratio, width to height. The list of resolutions can be scrolled up and down. Press the Back button to return to the Camera app’s main screen. All the images you shoot from this point on are at the resolution you set in Step 5. Check the video quality before you shoot! 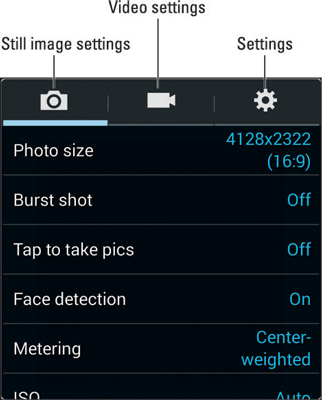 The phone’s front-facing camera has different (and lower) resolutions than the rear camera. You must first switch to that camera to set its resolution. Yes, low resolutions are just fine for uploading to Facebook. The resolution of the output device (a computer monitor or tablet screen) is low; therefore, you don’t need to waste storage and upload time sending high-resolution images or videos to Facebook. Megapixel is a measurement of the amount of information stored in an image. One megapixel is approximately 1 million pixels, or individual dots that compose an image. It’s often abbreviated MP.